I walked in sunlight through the frost to discover the market full of life early this morning. 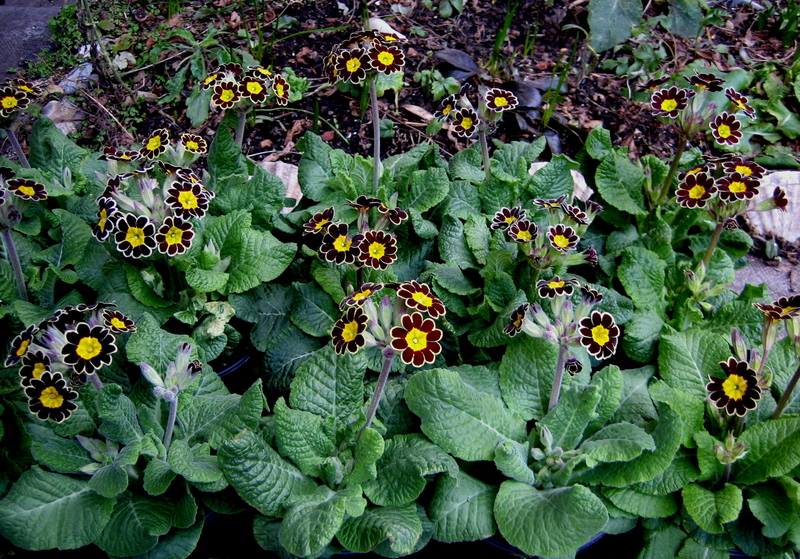 The very first thing that caught my eye were these Auriculas (or Laced Primulas) and I bought the only tray of fifteen plants outright for £10. On the very same Sunday last year, I also bought the only tray of Auriculas from Denise who grows them in a nursery at Battlesbridge in Essex, and they were much admired. 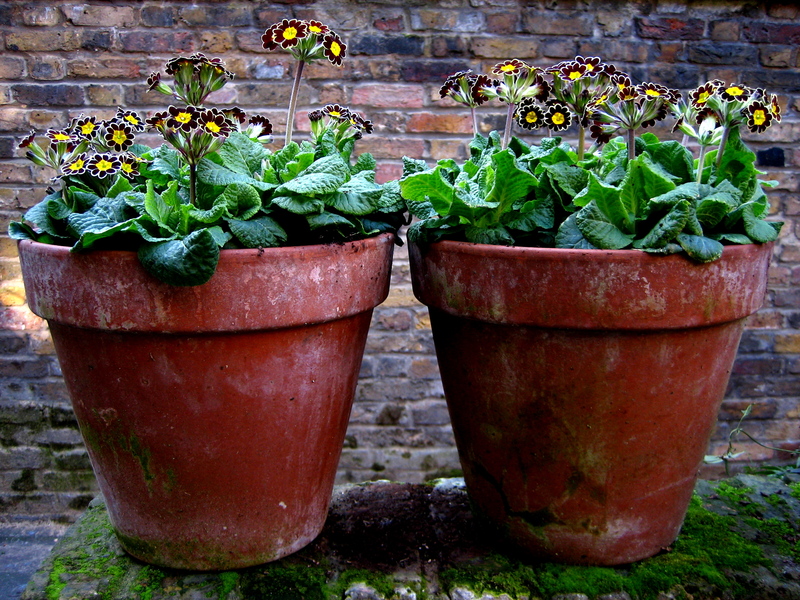 In fact, I learnt that Auriculas are believed to have been introduced by the Huguenot weavers in the sixteenth century, which makes it especially appropriate to have them here in Spitalfields. Auriculas have had a special place in my affections since I first saw them when I visited the writer Lucy Boston at the Manor, Hemingford Grey in Cambridgeshire – a twelfth century manor that has been continuously inhabited since it was built and is believed to be one of the oldest houses in England. Lucy was ninety-seven at the time and warned me over the phone that she was no longer walking much, when I called to say I was on my way. So I did not know what to expect, but when she opened the front door, to my surprise, she said “Follow me!” and ran upstairs. When I commented in admiration at the breadth of the ancient floorboards in the upstairs hall, each of which was the size of a whole tree, Lucy replied, “Oh but these are not original, these were put in recently – in the fourteenth century.” The Manor at Hemingford Grey was the house that inspired Lucy Boston to write her celebrated series of children’s books about Greene Knowe and it is the most truly enchanted place I have ever been. Among many highlights of her remarkable garden, Lucy had a section of black flowers and this is where I came across the Auriculas. Although, in general, I am not an enthusiast of articifial-looking flowers, Auriculas are the exception to my rule. I love the delicate borders on each petal that seem to have been painted on. The ones I bought today from Columbia Rd are a satisfying russet colour with custard-yellow borders to the petals and egg yolk-yellow centres. If I deadhead them conscientiously, they will give me two months of spectacular flowers, as they did last year. And if, by chance, we should get more snow, I shall run outside and carry my pots of Auriculas inside to shelter them from the blast. Aren’t auriculas irrisistible? They always seem to have such remarkable color combinations. I don’t know much about them, and wonder if over many years more and more colors have been cultivated. Best wishes with prolonging the blooming season for your new acquisitions. I thank you for your appreciation of Lucy Boston. That visit you made to her home also seems to have been remarkable. Ooh I love these auriculas ,they look gorgeous. I have a ‘Puffin’ copy of ‘The children of Green Knowe’ bought a long time ago and on hunting it out i find that there are some lovely illustrations that look like lino cuts or etchings done by Peter Boston. I wonder if this is Lucy’s husband or son? The book is dedicated to her son so i presume her son did the illustrations. There’s an interesting article on Lucy Boston’s patchwork quilts in the latest (March/April 2010) issue of Selvedge magazine, She used to garden in the summer and sew patchworks in the winter.